ILCA is seeking new builders to complement its existing network of manufacturers, the International Laser Class Association (ILCA) announced today. The move comes after longtime builder of the class dinghy, Laser Performance (Europe) Limited (LPE), breached the terms of the Laser Construction Manual Agreement (LCMA), which seeks to ensure the identical nature of all Laser class boats, regardless of where they are built. “We’re disappointed to see such a long and productive relationship come to an end, but we had to move ahead in order to protect the level of competition and the investment for the 14,000 members of the International Laser Class and the more than 50,000 sailors around the world who regularly sail the Laser dinghy,” said Class President Tracy Usher. With its UK-based manufacturing facility, LPE was the ILCA-approved builder that produced boats for most of Europe, Asia and the Americas until earlier this week, when Usher says the class terminated the LCMA with respect to LPE after the builder’s refusal to allow inspection of the boats being built in their manufacturing facility as required by that contract. “Doing what’s right for the sailors” is really all that matters, according to ILCA Executive Secretary Eric Faust, who emphasized that there will be no disruptions to the the 2020 Olympics or to any major ILCA event. “Performance Sailcraft Japan will supply all the boats for the Olympic competitions in Tokyo, while the next two World Championships are in regions with Performance Sailcraft factories. These are existing, class-approved builders so we expect no issues,” said Faust. “We’re confident that we’ll see new builders coming on line soon, and that we’ll once again have a robust dealer network around the world in plenty of time for the lead up to the 2024 Olympics,” he added. With PSA and PSJ supplying boats and parts to sailors formerly served by Laser Performance over the next few months, Faust expects the disruption to class owners to be minimal or non-existent. ILCA understands that many of our sailors will have additional questions about this news. Please know that we plan to post a FAQ with more detailed information soon. Finally, ILCA would like to thank all of our sailors, coaches, members and enthusiasts for their support of the class over the years and we look forward to a prosperous future ahead. The 2019 International Laser Class Association Handbooks are available. They will be mailed to members soon (not a member join here) and can be viewed online here. All current ILCA members worldwide are invited to vote on 2017 Rule Changes now, via a quick, 4-question online survey. Voting is open 10 April to 10 October 2017. Click here to view rule changes and cast your vote. Proposed rule change: Proposed rule change: Delete current Rule 22 (a)-(d) shown below in strikethrough text and replace it with new Rule 22 (a)-(e) shown below in RED text. (a) One compass mounted on any part of the deck or the cockpit is permitted if the hull cavity is not pierced by anything other than the fasteners. Compasses may not be fitted to inspection ports. An additional wrist mounted compass is permitted. Electronic, self-contained, digital compasses using only magnetic input are permitted. (b) Timing devices are permitted. (c) A timing device and electronic compass may be integrated in the same device. (d) A compass or timing device must not be capable of displaying, delivering, transmitting, receiving, calculating, correlating or storing information about wind speed, wind direction, boat speed or boat position. (e) Any use of electronic equipment not specifically allowed in the rules is prohibited unless the rules are modified by the sailing instructions. (a) One compass is permitted mounted on any part of the deck or the cockpit, provided that the hull cavity is not pierced by anything other than the fasteners. Compasses shall not be fitted to inspection ports. Electronic and digital compasses are prohibited (see exception in part d). (b) Any use of electronic equipment not specifically allowed in the rules is prohibited unless modified in the sailing instructions. (c) Timing devices are permitted. (d) A timing device that includes an electronic compass is permitted as long as it is worn on the wrist. Reason for change: To allow the use of affordable electronic digital compasses that are not GPS enabled. Proposed rule change: Add new Rule 28 in RED text as below. 28. One camera may be attached to the sailor or may be mounted on the boat if the hull cavity is not pierced by anything other than the fasteners. Reason for change: To allow the use of cameras. Proposed rule change: Modify Rule 3(f)vi by deleting the words in strikethrough text and adding the words in RED text as below. vi. 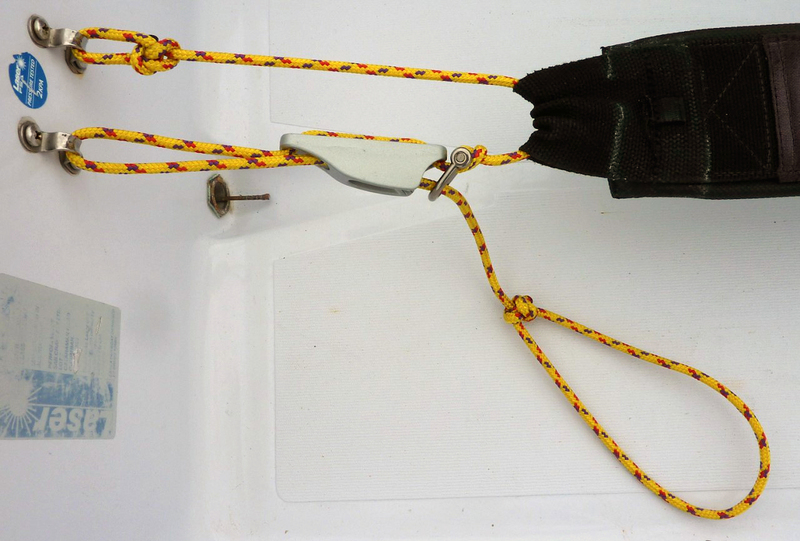 A shock cord for use as an inhaul may be attached around the boom immediately in front of the outhaul cleat or to the outhaul cleat and then to the clew of the sail, the clew tie down, the optional block at the clew, the quick release system or through the clew of the sail and to an optional block in the primary control line. A shock cord may be used as an inhaul on the clew. Reason for change: To remove the restrictions on the attachment points of the shock cord inhaul. Proposed rule change: Modify Rule 17c by adding the words shown in RED text as below. 17c The hiking strap supporting line, between the aft end of the hiking strap and the eye straps on the aft face of the cockpit, may be rigged in any manner so that the hiking strap is fixed or adjustable and may include one cleat; one ring, thimble, or shackle; or both. Reason for change: To allow for the addition of one cleat and one turning point in the hiking strap support line that are not attached to the hull or the hiking strap. The class legal composite mast will be available in early 2017. The International Laser Class Association (ILCA) is pleased to announce the release of a class-legal composite top mast section that is expected to be available for purchase in early 2017. Because the new mast was designed with the exact same weight and bend characteristics as the existing aluminum upper sections, it will not provide a performance advantage but instead will eliminate the permanent bending problems associated with the aluminum spars. Because the composite mast is now a fully approved change to the Laser Construction Manual, there is no need for a change to the Laser Class Rules. As long as the mast is purchased from an approved Laser Builder or one of its authorized dealers, it will be legal for use at all ILCA sanctioned events. The new mast specifications have been developed in close cooperation between the approved Laser Builders, World Sailing and ILCA. Because the composite top section is class legal and it will not provide any advantage in performance on the water, neither ILCA nor World Sailing anticipate that the use of the composite mast will need to be restricted for any future events. If it is subsequently determined that the use of the mast needs to be restricted, this will be controlled by Notice of Race on an event-by-event basis. The new radial cut standard sail has been approved and will be available soon. The International Laser Class Association (ILCA) is pleased to announce the release of a completely new class-legal design for the Laser standard rig sail. The release marks the first time in over 40 years that the Laser sail design has been substantially updated. Known as the Standard Mark II Sail, the new patented design is the result of thousands of hours of design work and on-the-water testing involving the Laser builders, the Association, two major sailmakers and some of the world’s top sailors. 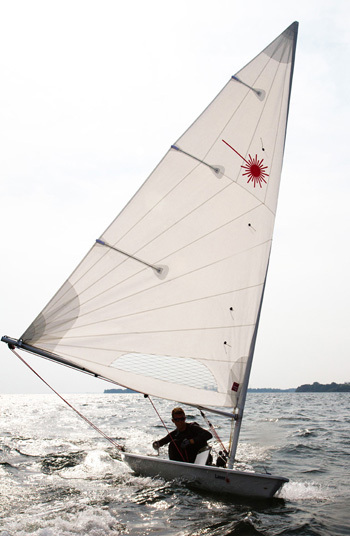 The Mark II features bi-radial panels, a heavier 4.5 ounce cloth and optimized reinforcement patches, all intended to maximize the sail’s competitive life. The sail also features tapered battens with Velcro batten pocket closures, a larger window for improved visibility and a patented re-designed luff tube to eliminate wrinkles at the mast joint. As with all changes to the Laser, the new sail has been carefully designed to be backwards compatible with the existing equipment, meaning it was not designed to provide improved performance. Instead, the Mark II promises improved durability and ease of use. The initial run of class-legal Mark II sails is expected to be available in late 2015, with worldwide availability by early 2016. Because of the timing of the release, by agreement with International Sailing Federation (ISAF) the Mark II will not be used in the 2016 Olympic Games or any Olympic country qualifying events for 2015 or 2016. The use of the sail will be controlled by the Notice of Race for each event until after the 2016 games. After that time, the Mark II will be allowed in all ILCA sanctioned regattas along with the original standard rig sail. In coordination with ISAF and the Laser Builders, ILCA will make further announcements about the availability of the Mark II sail and its use at events over the coming months. Following the ISAF Statement from yesterday, the ILCA has made a statement clarifying their position, the status of the class and providing some details on the rule change that was adopted. Read the post here. Today the International Sailing Federation has posted a statement on the Laser Class. ISAF has ended their original contract with Bruce Kirby from back when the Laser became an ISAF class and they have gone ahead and accepted the 2012 Laser Class Rule Change allowing ISAF and ILCA to approve builders of the Laser who have the right to use the Laser trademark. North American Laser Class Association District 11 covers Maryland, Virginia, Delaware and West Virginia.